You can edit main SEO tags here. Click “Edit” icon to edit section main tags. Fill in section title, keywords and description in all available languages and save the changes. Title pages, Title tag – is one of the most important factors that allows to reach the highest positions of the site in the search results. First of all Title tag is an element of HTML code, which is responsible for the words that appear in the title of your web browser by viewing a page. Search engines and Title tag. All search engines use Title tags to collect the information about your site. A word or words indicated in Title tag will appear as links at the search results page. Those are links that help users to go to sites from search engines. Limit length to 65 characters (including spaces) or less. Keywords Any keyword mentioned at the site should be included in the tag. Similarly, if you use the word in the tag, it should be mentioned at your site. Try to determine keywords as exact as it possible. It is not recommended to use general words. In this case your page will be lost in millions of similar words. Avoid a repeating of one word, even with consideration for repeating of a word in different forms it can be mentioned effectively at most three times. Don’t use such symbols as commas and dots (, .). Robots read a limited number of symbols in a tag (usually up to 200 symbols). Description Try your description to look attractive. Of course it should direct to a certain site. The description should be laconical. The most of search engines can detect more that 170 symbols in the tag but they show only 170 symbols in the search results page. Be careful by writing a Description. It appears in the search results very often and can influence on your site’s position. Looking at the description in search results users make a decision whether they visit your site or not. H1 header Search engines seek sites depending on headers level (it decreases from h1 to h6), that is the reason why it is necessary to include keywords and phrases into the headers text. This section allows setting SEO tags (title, keywords, description and H1) per module. Choose site section in the drop-down menu, choose a module and edit its SEO settings. These are module SEO settings. Module folder name shouldn not contain first symbols of a text block (if a text part comes first). I.e. exclude cases when other working links may be rewritten. This tab shows your site characteristics influencing search engine rankings. Basic information – is the age of your domain, Google Page Rank is a page rank of an index page of your site. Please note that age of a domain is being determined by the date of registration of the second-level domain. What is technorati authority? Read Technorati Authority FAQ. Alexa Information Backlinks shows the number of sites linking to the analyzed domain. 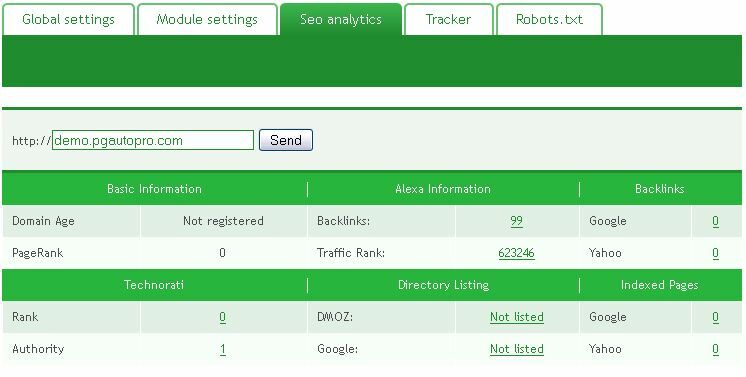 The Alexa Traffic Rank will show how popular the site is compared to yours, including Reach, Pageviews and more. You can use the link of Alexa site to get more information. Directory Listing. Check on peresence of your site in DMOZ (Open Directory Project)and Google Directory. Backlinks. Find out sites and pages which link to your site with a help of Google and Yahoo. Please note search engines do not show all backlinks. Indexed Pages. To determine the number of Google indexed pages you can use the clause [site:]. If you include [site:] in your query, Google will restrict the results to those websites in the given domain. For instance, [help site:www.google.com] will find pages about help within www.google.com. [help site:com] will find pages about help within .com urls. Note there can be no space between the “site:” and the domain. This functionality is also available through Advanced Search page, under Advanced Web Search > Domains. 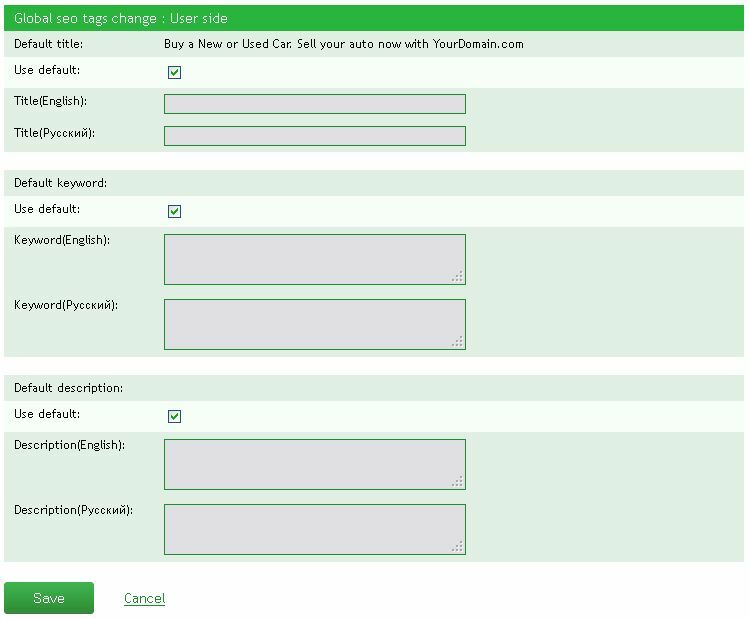 With the help of this tab you can activate Google Analytics code. Google Analytics is absolutely free and there are many benefits that come with installing it on your site. The Google Analytics allows tracking your website easily and with lots of data. Google Analytics shows you how people found your site, how they explored it, and how you can enhance their visitor experience. With this information, you can improve your website return on invest-ment, increase conversions, and make more money on the web. To start using Analytics, sign in with your Google Account and get Google Analytics UA number for your domain. 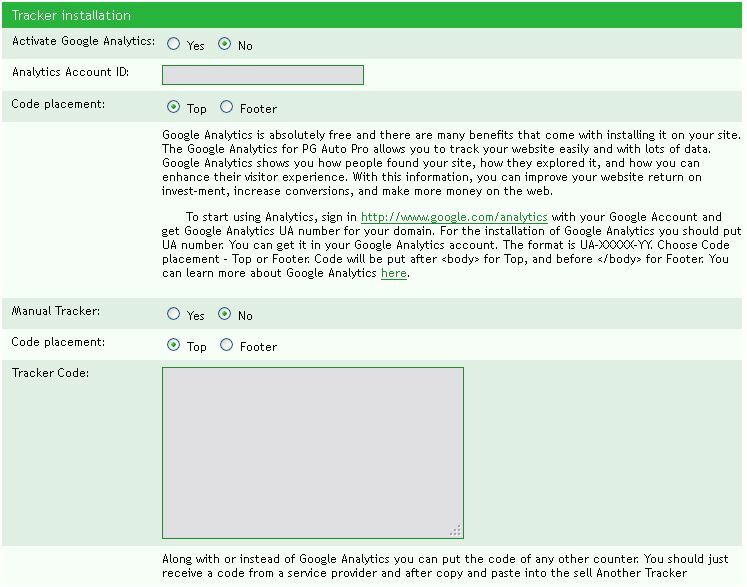 For the installation of Google Analytics you should put UA number. You can get it in your Google Analytics account. The format is UA-XXXXX-YY. Choose Code placement – Top or Footer. Code will be put afterfor Top, and beforefor Footer. Along with or instead of Google Analytics you can put the code of any other counter. You should just receive a code from a service provider and after copy and paste into the sell Another Tracker Code. A robots.txt file restricts access to your site by search engine robots that crawl the web. These bots are automated, and before they access pages of a site, they check to see if a robots.txt file exists that prevents them from accessing certain pages. In the file webmaster can set parameters for site indexation not only for all robots but also for each search engine separately. Check A Standard for Robot Exclusion and Google Webmaster Tools Help. Sitemap is a XML file with information for search engines (such as Google, Yahoo, Bing) about site pages to be indexed. Sitemap can help search engines to determine location of site pages, time of their last update, update frequency and importance with reference to other site pages in order the search engine would able to index the site more adequately. Set frequency of content update at your site in the field “Change frequency”. 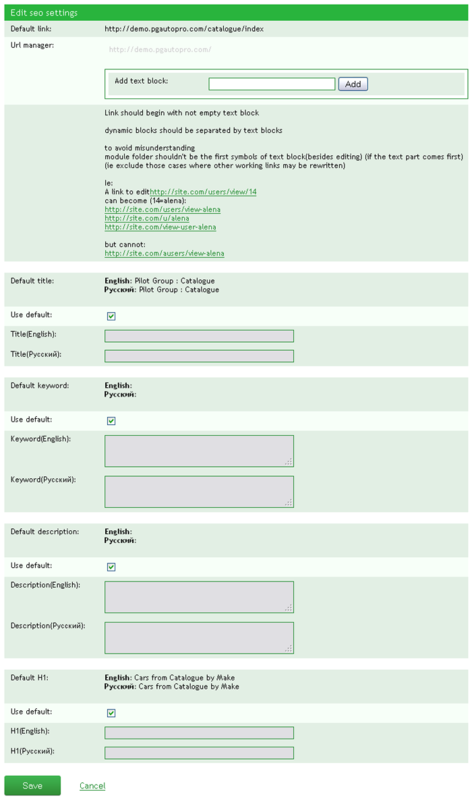 Set date of creating your site’s pages in the field “Last modified”. Priority – it only lets the search engines know which pages you deem most important for the crawlers. Check Adding additional information to a Sitemap and About Sitemaps. So, in the file Robots.txt you can indicate pages, directories which should be excluded from indexation, and set the path to the file Sitemap.xml. Sitemap.xml is being formed automatically by creating of new pages at your site. Set additional parameters, click on “Generate Sitemap” to create it manually, the file will be created according to your request. Keep in mind that it can take time by great number of pages. Here you can also generate Sitemap.xml file. Check Adding additional information to a Sitemap and Webmaster Tools Help About Sitemaps. So, in the file Robots.txt you can indicate pages, directories which should be excluded from indexation, and set the path to the file Sitemap.xml. Sitemap.xml is being formed automatically by creating of new pages at your site. Set additional parameters, click on “Generate Sitemap” to create it manually, the file will be created according to your request. Keep in mind that it can take time by great number of pages. You can set Html Sitemap using such path: /admin/menu/site_map.